Whitehall’s softball team is playing some of its best softball of the season at exactly the right time. The Railroaders have won their last four games to inch their record above .500 in the Adirondack League. 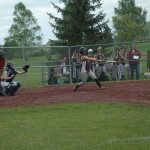 On Monday, Whitehall defeated Hadley-Luzerne 15-1. Paxton Peterson led the charge offensively for Whitehall, going 3 for 5 with three runs scored and two RBIs. Brooke Paddock had two hits for Whitehall and Brittney Putorti allowed only four hits in seven innings while piling up nine strikeouts. The Railroaders scored in every inning except the first, including six runs in the fourth inning to blow open the game. The rout came several days after a gritty come from behind victory over Fort Edward last Wednesday. Trailing 5-4, Whitehall scored two runs in the bottom of the seventh inning to walk off with a 6-5 win. Rachel Lavin, hitting in the ninth spot in the order and representing the tying run, reached first base on a well-placed bunt down the third baseline that just stayed fair. Two batters later, Brittney Putorti drove Sam Godfrey’s offering to centerfield, plating Lavin and tying the game at 5-5. Down to their final out, Ariel Ayers, who had injured her right ankle sliding into third base earlier in the game, limped to the plate and hit a groundball to second base that was bobbled on the throw to first, allowing Putorti to score all the way from second. Brittney Putorti picked up her seventh win of the season, scattering seven hits over seven innings and recording nine strikeouts. Whitehall managed only three hits in the game, but two—Lavin’s bunt single and Brittney Putorti’s double—came at the most opportune of times. After starting the season 2-8, Whitehall has gone 7-1 over its last eight games to improve its record to 8-7 in the Adirondack League and 9-9 overall. Based on the virtue of its Adirondack League record, Whitehall has compiled enough wins to qualify for Sectional Play but Pam Putorti said she is leaving the decision to play in the postseason up to the team’s seniors. The team was scheduled to play Fort Ann on Tuesday (results weren’t available before the paper went to press). If the team decides to play in the Sectional tournament, it will learn its opponent on Monday.